The purple mangosteen (Garcinia mangostana), colloquially known simply as mangosteen, is a tropical evergreen tree believed to have originated in the Sunda Islands and the Moluccas of Indonesia. It grows mainly in Southeast Asia, southwest India and other tropical areas such as Puerto Rico and Florida, where the tree has been introduced. The tree grows from 6 to 25 m (19.7 to 82.0 ft) tall. The fruit of the mangosteen is sweet and tangy, juicy, somewhat fibrous, with fluid-filled vesicles (like the flesh of citrus fruits), with an inedible, deep reddish-purple colored rind (exocarp) when ripe. In each fruit, the fragrant edible flesh that surrounds each seed is botanically endocarp, i.e., the inner layer of the ovary. Seeds are almond-shaped and sized. The purple mangosteen belongs to the same genus as the other, less widely known, mangosteens, such as the button mangosteen (G. prainiana) or the charichuelo (G. madruno). Mangosteen is a native plant to Sunda Islands and the Moluccas of Indonesia. Highly valued for its juicy, delicate texture and slightly sweet and sour flavour, the mangosteen has been cultivated in Java, Sumatra, Mainland Southeast Asia, and the Philippines since ancient times. The 15th-century Chinese record Yingyai Shenglan described mangosteen as mang-chi-shih (derived from Javanese manggis), a native plant of Java of white flesh with delectable sweet and sour taste. There is a legend about Queen Victoria offering a reward of 100 pounds sterling to anyone who could deliver to her the fresh fruit. Although this legend can be traced to a 1930 publication by the fruit explorer, David Fairchild, it is not substantiated by any known historical document, yet is probably responsible for the uncommon designation of mangosteen as the “Queen of Fruit”. The journalist and gourmet R. W. Apple, Jr. once said of the fruit, “No other fruit, for me, is so thrillingly, intoxicatingly luscious…I’d rather eat one than a hot fudge sundae, which for a big Ohio boy is saying a lot.” Since 2006, private small-volume orders for fruits grown in Pierto Rico were sold to American specialty food stores and gourmet restaurants who serve the flesh segments as a delicacy dessert. 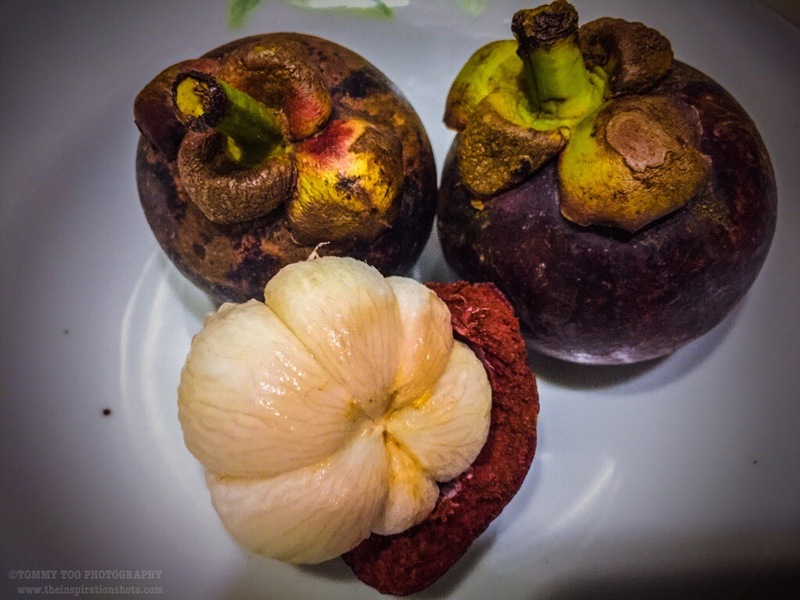 Posted on August 30, 2016, in iPhoneOgraphy 366, Photography and tagged #fruits, #iphone6plus, #iphoneography366, #photography, mangosteen, photooftheday. Bookmark the permalink. Leave a comment.